Whether you need to do so for yourself or for someone else, there is sometimes a need to create a listing of the contents of a particular directory, set of directories or a whole drive. With the size of hard drives today, keeping track of all the data files stored on them is handy and it can be useful to catalog file collections and folders so you know what’s buried deep down inside multiple folders as well as what’s in the root folder. There are very simple ways of doing this without software and one is by using the command “Dir [folder] > File.txt” from the command prompt, but why play around in a DOS window when you don’t have to? Here’s a selection of 10 free tools to save or print out content lists of the files inside your folders in various ways including plain text or an HTML document. Dir2Html is a tool which is free for personal and commercial use and has a number of useful options to aid in the creation and customization of the HTML index file. 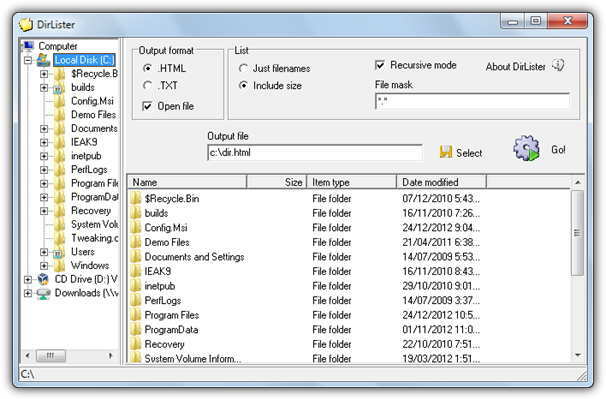 It supports recursive folder indexing, a simple file mask, create a sub-section for each subfolder, exclude hidden files and folders, include size, date and many other options. The right side of the window allows you to tailor the output HTML file visually and you can add a customized title, alter the font sizes, colors and resize different areas of the output. Dir2Html has a lot of options but many of them you can leave to the defaults if the standard layout is good enough. Compatible with Windows XP, Vista and 7. DirLister is quite a simple tool which will give you a file and folder list, including a recursive mode to go into sub directories, and then output the result to an HTML or plain text TXT file. 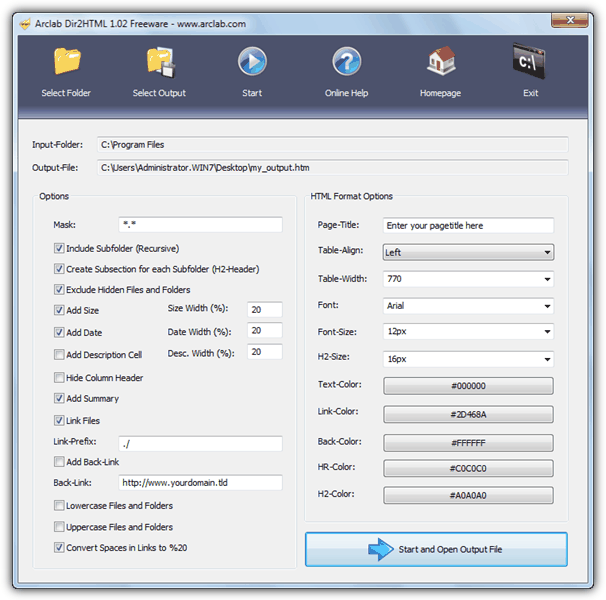 There aren’t many options to configure apart from a simple file mask and the option to include the file sizes or just display the file names. It also creates a right click context menu entry called List Drive which will create and open a file for the directory you click on in the format using the options from the main window. Tested on Windows 7. Rather strangely this DIR2HTML tool needs installing even though the program itself is a standalone executable file of only 37KB and can easily be made portable. Although the main window is small there are quite a few options crammed in there to tailor the output HTML file to your liking. Recursive directory depth, size, time, date, sort by, size type and a simple file mask are all options that can be used. If you enable the Make Links and Link only Directories boxes the saved HTML file will have a full hyperlink directory structure to browse. Even though it’s from 2001, DIR2HTML worked great on Windows 7 64-bit. TIP: Make sure to create a separate folder for the HTML file to go in because the program will create a full directory structure for each sub directory included in the list and place an HTML file for the file contents inside each one. The free version of Directory List & Print is a severely cut down version of its shareware offering and the first thing you will notice about the program is just how many options are grayed out in this version, and you also get a 5 second nag at the start. One of the few things to be usable though which many users could find useful is the option to output the result directly to Word or Excel, or you can print or copy to the clipboard, although even saving to plain text is disabled. There is also the ability to include file sizes, dates, times, attributes and extensions. On testing we found the program to be far slower to process the lists than many of the other smaller and older portable tools available here. 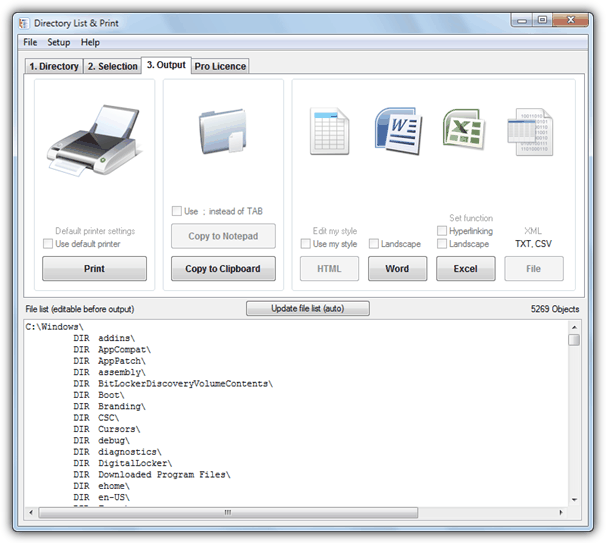 Directory Printer has been a popular tool for several years for printing and saving file and folder lists because of the sheer amount of options you can configure to get the output to your liking. Both files and folders have 12 bits of information that can be displayed including date, size, attributes, version and specific folder / sub folder details. Also included is a file mask filter that already has 5 common format presets built in for images, music etc. There are various tick box options for hidden / system or read only files, including sub folders in the display and a few file sorting options. The separate Print and Save to disk tabs have a few different options to allow you to set different output styles. The last couple of things worth a mention are there’s a right click context menu function and the only truly useful output file is a text file. 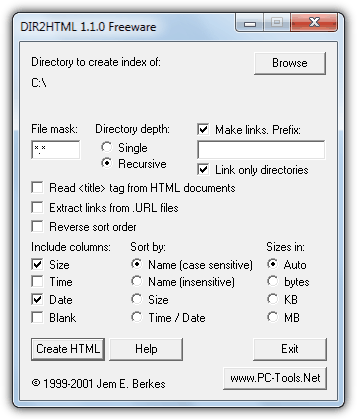 HTML and Excel / Word save options would have probably made Directory Printer almost untouchable in its field. Although it requires installation, you can copy the executable from its folder and use as a portable program. Works on Windows XP and above. 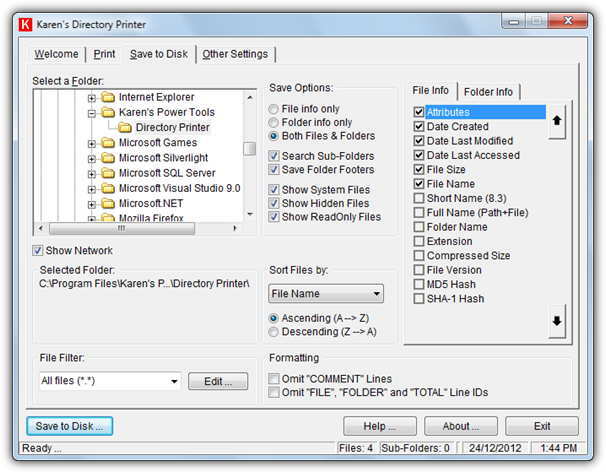 I have always like Directory Lister v0.9.1 by krksoft.com. There are portable versions online BTW. It looks like there is a newer paid/shareware version but v0.9.1 as of 2006 works fine on Windows 7 however I have not tried any newer version of windows. It has all the options I need to configure the output and the output can be previewed, modified, previewed and saved or copied to clipboard in text, html or csv formats. It does everything I require, nothing more or less. I’m using YourDir, which doesn’t have so many fancy options like the above, but is really easy and saves to either CSV or creates an image file, which I’m using a lot. Will any of these suggestions work with Win 10? Directory List and Print is the only one for me. THE single clincher is its ability to output to Word. I’ve used it to produce lists, tables of contents, indices of hundreds of separate music, image, video files and folders which would have taken years to produce manually and which can be printed. And once in Word, editing is easy – using find and replace to produce a style uniformity. It makes the rest look amateur. Snap2HTML is the BEST! It does exactly what I was looking for and I spent quite a bit of time searching! So happy I found it! I’ve tested all of them and the Snap2HTML was the best for me. Its design is exactly what I was needing. The DIR2HTML and ArcLab are good options too but for what I needed, the Snap2HTML is the first one. DirLister works in a test install, but unlike stated in Raymond’s mini-review (thank you) I was unable to get a listing that included folder names without an unwanted recursive listing. Maybe folder names do list with recursion, but I didn’t have time to try that, and it still wouldn’t help me. Also file sizes is one of several future features not implemented after years of version 1.0, but the author said he would have to need these features before implementing them. It is indeed a great tool and creates HTML file of the directory in a whisker and handy for the web designers. It has built-in option to search the directory too. I used it for creating a directory containing nearly 4 TB of Files in thousands of sub-directories. It is simply an awesome tool with clean interface and easy to use. Special thanks to the Mr. Dan, the developer of SNAP2HTML. The one I’ve been using for years is Rep-Listing 3.0 (Jean-Pierre Aigron, 2004) ; apart from a few minor bugs and quirks (incorrect file sizes above 2GB, annoying question asked every time the program is opened about « margins set outside the printable area ») it’s complete, fast and efficient. The listings are clear and include the file sizes in bytes written as continuous numbers (i.e. with no spaces, for instance a VOB file will be : 1073709056), which was the feature I was looking for back then. I wanted to have a list of the contents for each one of my hundreds of archived CD/DVDs, with the accurate file sizes, so that I could quickly verify if a file I was about to download was already there somewhere, only by typing its size in Windows XP’s search panel (dearly missed on later iterations), searching inside the directory containing all the listings for a given category of content (then if I wanted to be sure I could take the corresponding disc from the pile and look at the file, or calculate its CRC). Now I no longer archive files on CD/DVDs (neither reliable nor practical) but it’s still useful to keep tracks of things. finally… free from DOS’ dir command, excellent tools! Brilliant!!.. Just what Ive been looking for, Thanks! nice tools this is great! thanks Raymond.